Peter H. Russell and David M. O'Brien, eds. This collection of essays by leading scholars of constitutional law looks at a critical component of constitutional democracy–judicial independence–from an international comparative perspective. 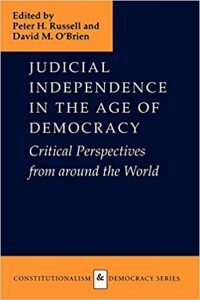 Peter H. Russell’s introduction outlines a general theory of judicial independence, while the contributors analyze a variety of regimes from the United States and Latin America to Russia and Eastern Europe, Western Europe and the United Kingdom, Australia, Israel, Japan, and South Africa. Russell’s conclusion compares these various regimes in light of his own analytical framework.